Gyroskope is now happy to offer RENTAL functionality to producers! Producers are now able to upload videos and choose between setting a rental duration (set the number of days/weeks a fan has to watch the media) or an access pass (the media expires in all fans’ collections on a specific date). These powerful tools are easy to use, and may be used in conjunction with a typical purchase, meaning a producer may set media to purchase and rental, or purchase only / rental only. The fan’s rental experience is also simple and enjoyable! Within the Collection page, a Rentals tab is now available where the user can choose to activate the rental and start the period of time they have to watch the media. 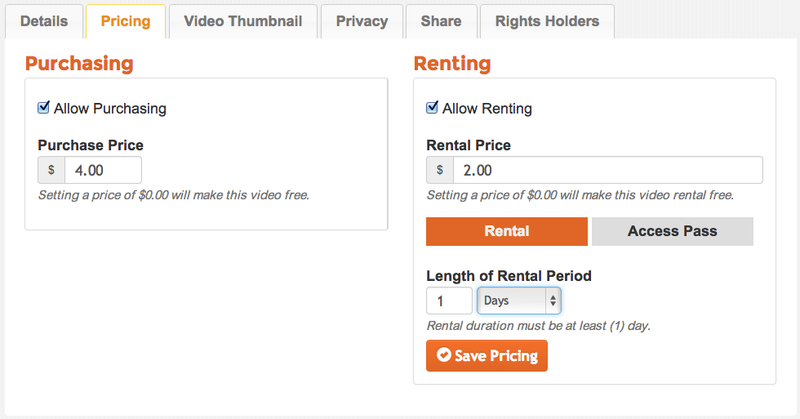 Once the rental time runs out, the option to re-rent is shown for a set amount of time, then automatically disappears. This entry was posted in Development, News and tagged Gyroskope, rental by alexmclark. Bookmark the permalink.